Salvador Dali was one of the leading artists of the twentieth century. This Catalan artist symbolizes surrealism and made a name for himself with his easily-recognised works. Want to know more about the life and works of this Spanish artist? Then these three places are a must for your holiday on the Costa Brava. Our first stop is the town of Figueres, where Salvador Dali was born on 11 May 1904 and is located north of Girona and west of Roses. 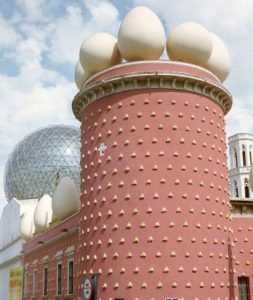 You can’t miss the Dali Theatre-Museum and it has the painter’s off-the-wall personality written all over it, with giant eggs topping the Galatea tower. It opened in 1974, and the location was not left to chance – Salvador Dali chose to build this museum opposite the church where he was baptised. This was also first place he displayed his work. The museum houses a collection of the painter’s artworks such as the Galatea of the Spheres or his Soft Self-Portrait with Grilled Bacon. You should also know that the Dali Theatre-Museum in Figueres is where Dali’s embalmed body is laid to rest. Now a museum, Dali used to live in this house. In fact, it is the only stable address that he is known to have had. He lived there until 1982 when he moved to Pubol castle following the death of his wife, Gala. The extensions added by the painter turned this little fisherman’s house into something of a maze. It features many parts of Dali’s life including his living quarters, workshop, and the grounds. Admire the view over the bay of Portlligat from the garden, then venture inside to discover an intimate interior which reflects the artist’s quirky personality. And there’s a recurrent theme… here too, the towers are topped with eggs! Next, we head to Pubol, east of Girona. Salvador Dali bought Pubol Castle in 1969. At the time, it was in a pitiful state. Dali and Gala completely renovated it, turning some of the property’s original features into wacky spaces so typical of them. The result is an array of interesting architectural delights such as trompe l’oeil details. This was Dali’s last workshop. He spent two years here before returning to Figueres after a fire at the castle. Where’s the best place to stay to visit these places? We recommend luxury villa rental on the Costa Brava in Spain. Make yourself at home near the beautiful little Mediterranean villages of Palafrugell, Begur or Pals. Enjoy all your creature comforts in a scenic location, and maybe even a sea view! 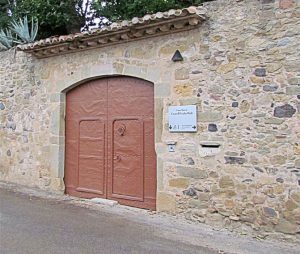 Rent a luxury villa in Spain and spend a holiday discovering the Dalian triangle, so-called because of the shape made on the map when you link the towns of Figueres, Portlligat and Pubol. The Dalian triangle will enlighten you about the life of this artist that hallmarked his era and whose weird and wonderful personality continues to intrigue. Next Post Renting a luxury villa in the Basque Country? Then you won’t want to miss these sights!